Family run since 2007. We are an approachable, friendly independent dealership offering you quality service with that personal touch. We are proud to be 5 Star rated and our friendly team has over 80 years experience in all aspects of the motor trade. 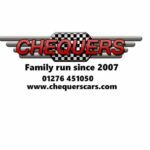 Visiting Chequers will be a pleasurable and relaxing experience with no pushy salesman peering over your shoulder, you can also view any of our vehicles in the comfort of our refurbished showroom. Our diverse low mileage stock covers everything from Prestige cars to City cars, we also specialise in Fiat 500’s and always have over 25 in stock in our dedicated Fiat 500 lounge. Pop in to see us and join the Chequers family.